enna suNdAyangaLAl ninRittAy ennai ALungaNNA? en kaNNA – oh krishNa who is obedient towards me! iyaRkaigaL – nature of acts? 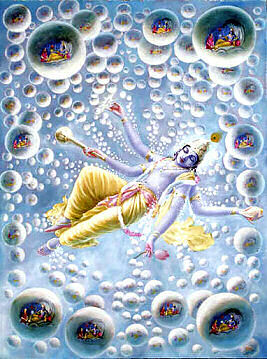 Oh krishNa who is obedient towards me! With what kind of selfish, sportive activities you remain! You are inconceivable to determine saying “you are of this particular nature” even for the most intelligent persons, and are difficult to know. Being the antharyAmi of the three types of worlds such as kruthaka, akruthaka and kruthAkruthaka, which are without a beginning and continuously flowing, you created them, and further pervaded them inside as antharyAmi and outside as the support; of what nature are these acts? enna … – Oh krishNa who has enslaved me! What [amazing] activities are you having! innadhOr … – You remain as the cause for everything, and cannot be estimated to be of particular nature, even by the most intelligent persons; as said in “brahmApi na vEththi alpam prayathnatha:” (Even brahmA does not know a little bit about sarvESvaran even after trying hard). munniya mU ulagum avaiyAy – Being the controller for the three worlds which are continuously existing since time immemorial [and being ancient due to that]. The term ‘three worlds’ would refer to three types of chEthanas [badhdha (bound), muktha (liberated), nithya (eternally free)] or three types of worlds [kruthaka, akruthaka and kruthAkruthaka]. avaRRaip padaiththu – When it is in the context of wealth [worlds], it means creating them; when it is in the context of chEthanas, it means bestowing them knowledge. pinnum uLLAy puRaththAy – Oh one who pervades as said in nArAyaNa sUktham “anthar bahiScha” (pervading inside and outside). ivai enna iyaRkaigaLE – You have them as your sport, and for us they remain amazing. This entry was posted in thiruvAimozhi, thiruvAimozhi 7th centum on October 26, 2018 by Sarathy Thothathri.